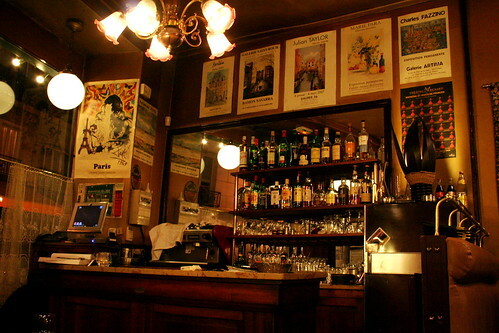 Not every meal in Paris can be “THE BEST” meal, can it? I think it can. Who is to say that, with the right preparation, one can’t eat an entirely new and amazing and utterly delicious meal every single time? Point in case, Happy Nouilles, this fantastic little Chinese place on Rue Beaubourg. The draw? 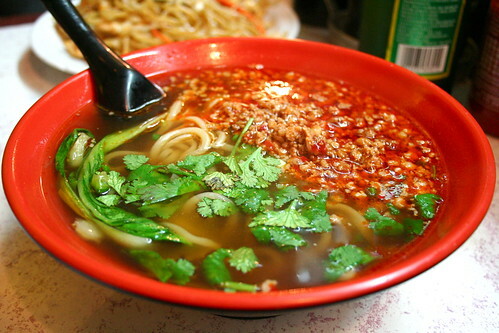 Hand-pulled noodles. A serious disappointment? Not getting up from my noodles to take a picture of the noodle maker at work (he stands int he front of the restaurant and makes each batch fresh-to-order–it’s pretty cool to see it up close). We ended up in the area after a cold and rainy tromp around the area and nothing sounded better than a hot, steaming bowl of soup and a pile of perfectly cooked noodles. The Filet de porc haché au miso et aux lamens lived up to the reviews I’d found online–a rich miso broth bathing spicy ground pork and gobs of the hand-pulled noodles–and was the perfect cure for a cold, wintering night. Springtime Paris had fled by then and all we wanted was warmth, warmth, warmth. 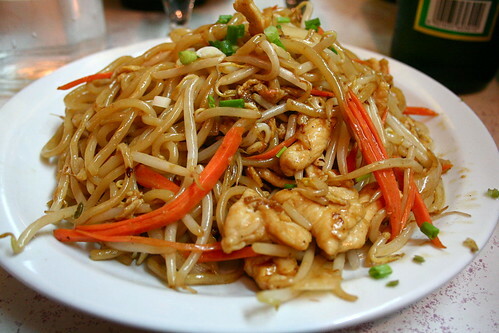 The other dish, sauteed noodles with chicken, was equally tasty and featured the noodles sauteed with pieces of chicken and vegetables in a soy-based sauce. It’s hard to explain why such simple dishes were so amazing, but I think it’s just that–the simplicity. Even the service at Happy Nouilles was excellent (quick to speak English, Chinese, or French, depending on your preference), especially given that you can eat there for way under 10€, an impressive feat in Paris. 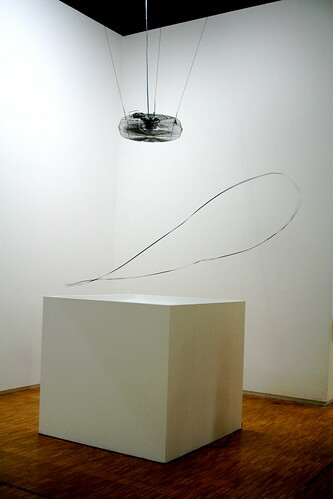 If you’re in the area for lunch or dinner, be sure to head down Rue Beaubourg to the Centre Pompidou for one of the best modern art collections I’ve yet to see. In case you’re confused, there are two entrances, with two different lines, one for the museum and one for the library. Be sure to find the line in the large courtyard around the block from Rue Beaubourg–we mistakenly stood in the wrong line for 20 minutes or so. 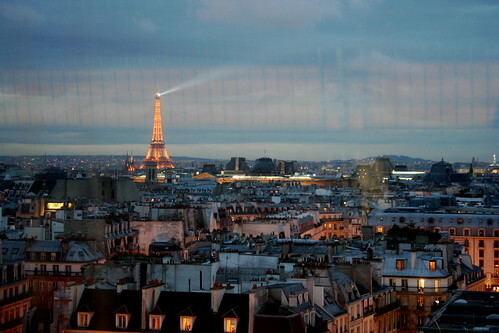 Another great tip is to arrive just before sunset–the building is beautiful as the sun sets given all the windows and after dark you’ll be met with an incredible view of nighttime Paris (not to mention the fun tube escalators on the outside of the building that you’ll ride up and down). 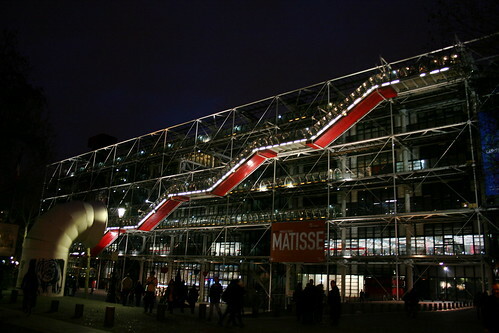 I’d kill to live in a city with a museum like the Pompidou, it’s a total gem. 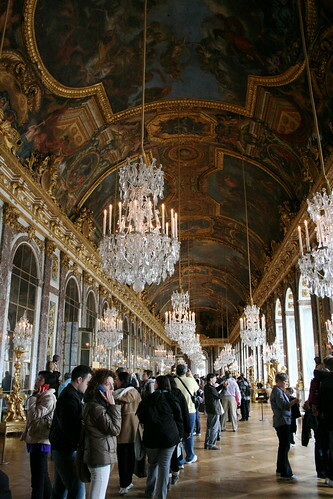 Though it didn’t fall quite as high on my list, G wanted to be sure to go to Versailles since he’d never managed to go during his previous trips to Paris. 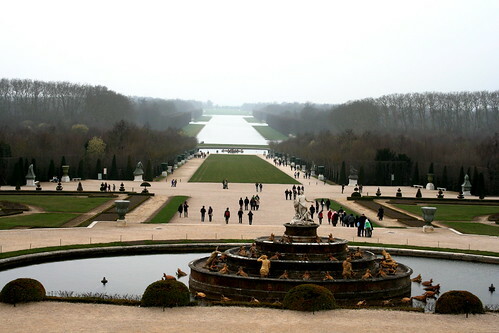 By the time we could make the day trip, the weather had turned gray and cold, so the part I was most looking forward to, the gardens, was pretty inhospitable. I could see how they’d be gorgeous during the spring or summer though! 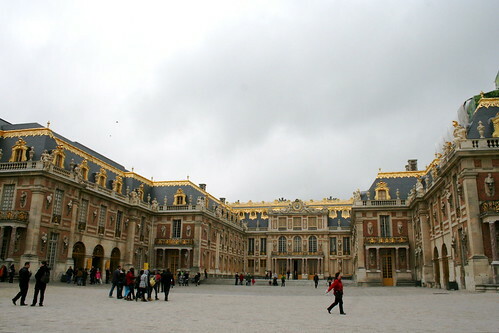 The palace itself was…well…gilt-y and more gilt-y, but that’s to be expected. 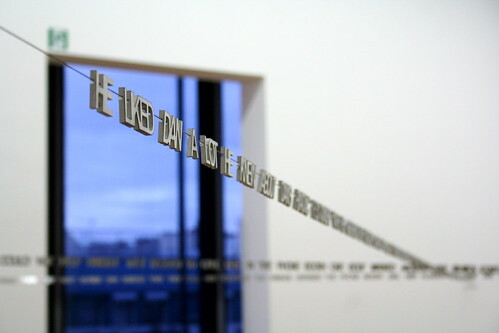 Definitely a must-do for any design, art, or history buffs. 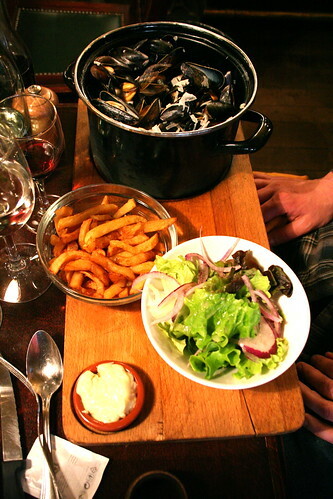 G ordered their lunch special of mussels (Les Moules Poulette) which came with frites and a salad (and yes, that entire pot is full to the brim with mussels). 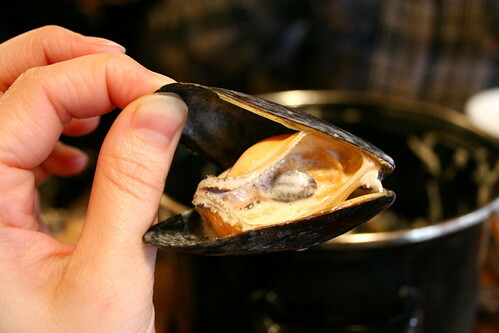 The mussels were cooked in cream, white wine, shallots, and mussels juice which was light and rich all at the same time with a nice hint of brine from the mussels juice. We also happen to be french fry whores, so we were happy to find the frites crispy and not overly-oily, perfect to dip in the broth. 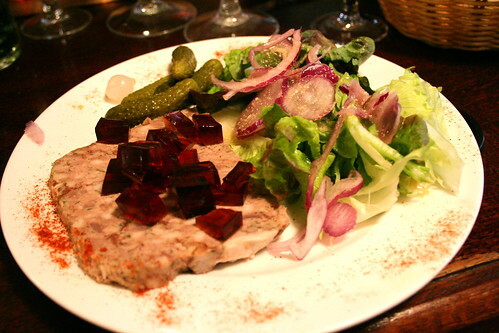 I ordered a two-course lunch and started with the Terrine de Campagne Maison–a rich “country” terrine of pork, chicken liver, and veal. On top was an aspic of some sort and a nice salad of mixed lettuces was served on the side. The terrine was perfectly executed, nothing cut too finely, and rich, perfect when eaten with some of the baguette we were given. Can’t say I was a fan of the aspic, but I gave it a shot. 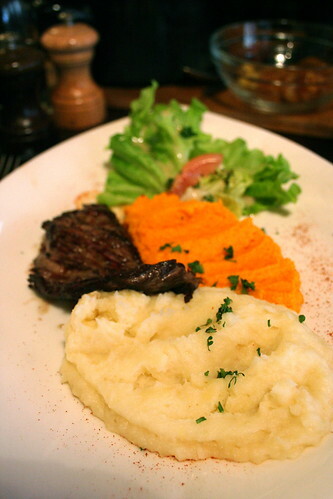 My main dish was the Pièce du Boucher, a seared hanger steak, served with mashed sweet potatoes and regular potatoes. Can we stop for a moment and talk about French mashed potatoes? I don’t know if I can get myself to cook with that much butter, but oh sweet jesus, it’s an excellent result. Those potatoes are to die for. And the mashed sweet potatoes were an excellent, seasonal surprise–prepared the same way with oodles of butter and cream, they were some of the best I’ve eaten in my life. As for the meat, it was delicious as well, seared quickly to ensure a perfect medium-rare, there was nothing tough about the cut or over done. Light and easy. 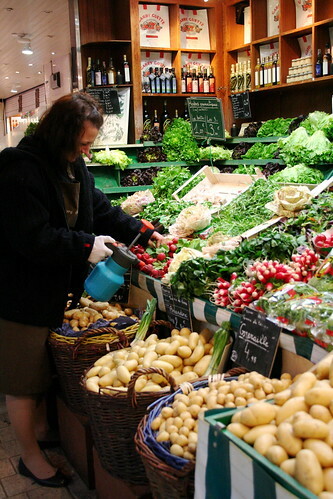 After our meal, we wandered back out into the blustery afternoon to walk through Versailles several market buildings. 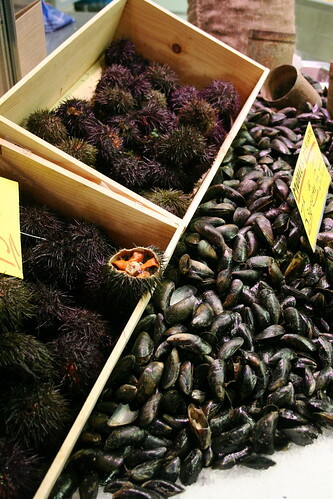 Though I’m sure we’d missed the rush of the morning, all the stalls were open and plenty of locals walked in and out buying vegetables and meat and seafood and other dried goods. 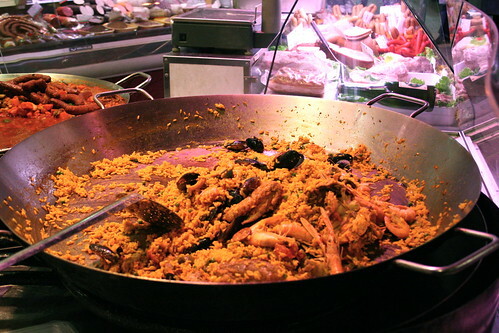 I was inspired, mostly, but the beautiful displays of seafood and vegetables, not to mention the giant paella pans steaming and ready for grab-and-go. 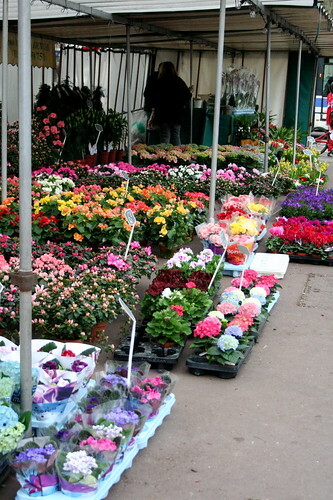 And who doesn’t love an open-air flower market? 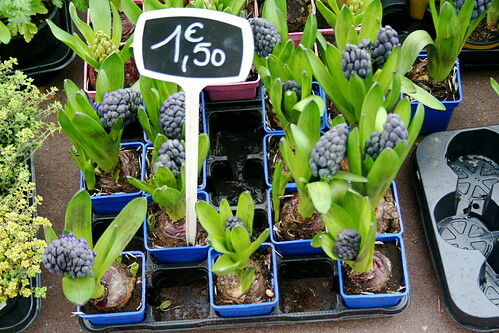 What I’d give to take a bouquet or a pot of hyacinths home! The market even sold bags of dirt and other gardening supplies. 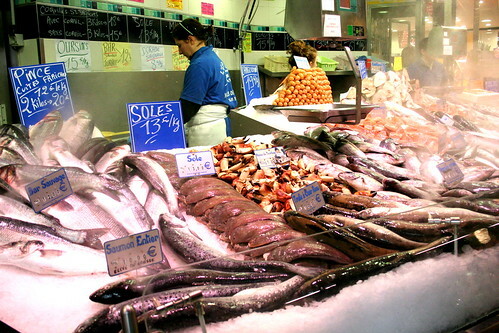 Who needs Lowe’s when you’ve got awesome markets like these? Come on, America, let’s get back to this. 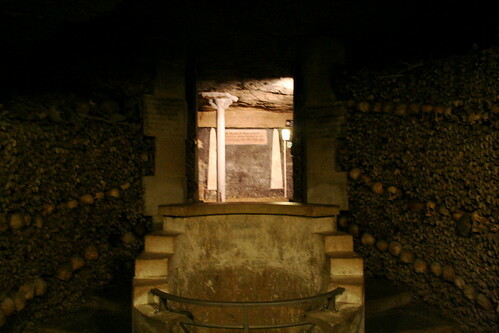 Back in Paris, we hit up the Catacombs early one morning and wandered around underground Paris learning about the both geologic Paris and dead-people Paris (I can’t think of any word for it, mortuary Paris? 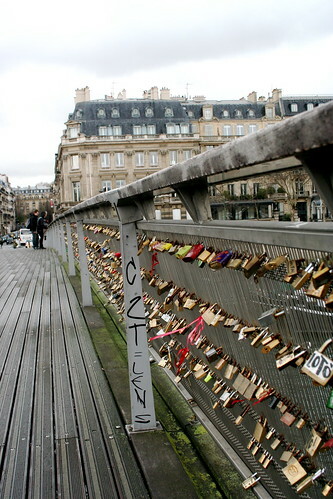 Paris in memoriam?) Turns out that Paris used to be (forever long ago) under the sea so it has a weird make-up of marine deposits and gypsum and whatnot (I obviously didn’t take any notes and several Google searches aren’t helping me–never mind that, it was cool.) 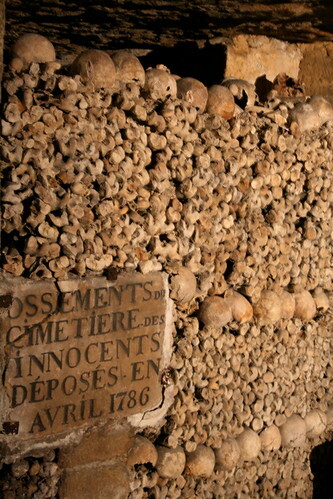 Geology aside, there are also over 6 million people interred in the catacombs, a project that started in the late eighteenth century with criminals and poor people, but, by the nineteenth century extended to all kinds of people. It’s a weird in-death mixing pot of social and economic strata, even weirder when you realize that all those bones are simply people. They could be you one day. Except that we no longer do such things with our dead which is a shame since I’d be all for it. It’s a beautiful if not slightly creepy place, and it definitely takes the mark as one of my favorite touristy non-food things in Paris. Well worth the wait. Post-catacombs, a sandwich found at some local bakery. 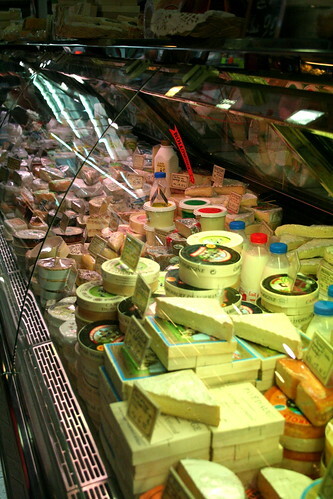 You can’t beat the grab-and-go sandwiches at any of the bakeries. This particular one was vegetarian–lettuce, tomato, egg, cheese, mayo–and was incredibly filling and cheap. G hasn’t found any better or worse version during his travels and I have to agree. As long as it’s an independent, neighborhood bakery, you’re in lucky. There’s delicious food to be had. Perfect for munching and walking. Which, trust me, we did plenty of walking. We did plenty of subway riding too since my feet are really crappy, but the walking was so much fun. 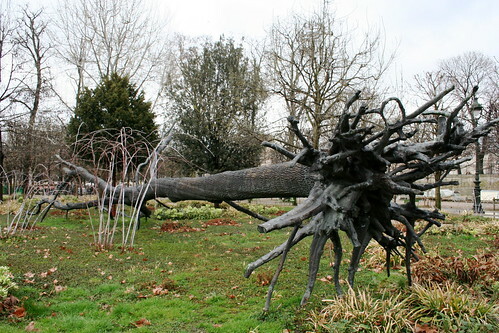 I love all of Paris’ parks and art, and I’m a sucker for bridges or the paths along the Seine. Seeing the locks on Pont des Arts in person was fun–we didn’t leave one, but who’s to say we won’t the next time we’re there? 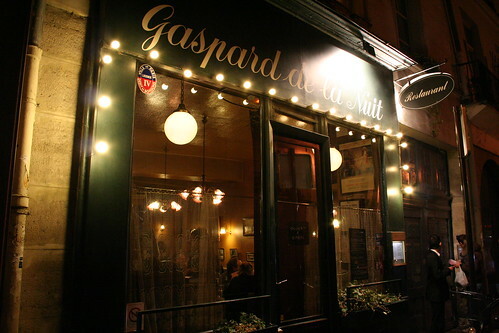 And, to wrap up this post, Gaspard de la Nuit, a restaurant I would have never found without my friend F’s recommendation and one that I fell in love with. All restaurants give a different vibe, and the feeling at Gaspard de la Nuit is that you’re welcomed into someone’s home for a beautiful, comfortable meal. Low lighting, milk glass lamps, dark wood, and an ever-full dining room, I was amazed at how quickly and graciously the owner managed to seat groups without reservations (even though most of the room seemed reserved when we showed up). The restaurant is unpretentious and unreserved and I can see why F fell in love with it during her time in Paris last year. 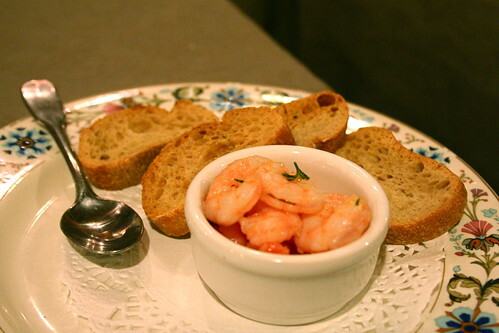 Before the meal, an amuse bouche of shrimp and toast arrived with our bottle of wine (2009 Cotes du Rhone Villages, for those who care), and who doesn’t like some butter poached shrimp and toasted baguette? Simple and unpretentious, just like the rest of the meal. A good sign. 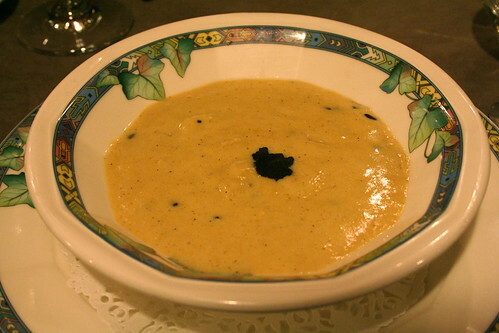 As a first course, G & I split the special for the day, Oeuf brouillés aux truffes. I have to admit, I wasn’t wowed by the dish. It tasted incredible–rich and eggy with a deep earthy hit from the truffles, I couldn’t ask for anything more flavor-wise. But, oh my, do they barely set their eggs. It was more like egg soup which, for G, was a total turn-off, and for me made the dish just a wee bit too adventurous. I wanted to fall head-over-heels in love with it, but just couldn’t from the texture. Win some, lose some. 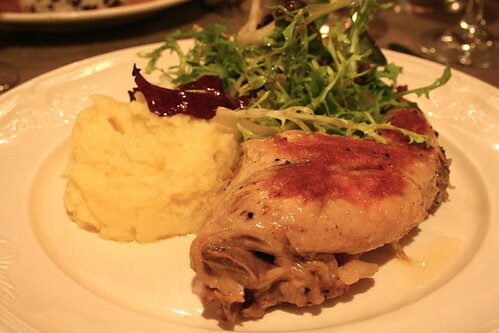 For a main, I ordered the Rabbit Confit, a delicious dish of rabbit confit, mashed potatoes, and a salad of frisee. I’m a sucker for duck confit and I’m a lover of rabbit, so rabbit confit seemed like the perfect marriage of two of my favorite things. And it was a succulent home run. Rich and gamey, the rabbit was light and meaty, and the mashed potatoes, again, was swimming in butter. It was everything and more one could want on a cold, wintery night. I felt snuggled into the dish as I ate it, the warmth from it fortifying and relaxing. 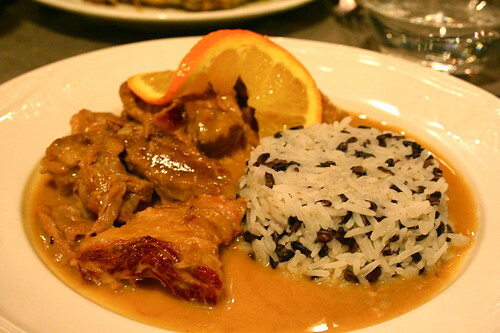 G’s main, the night’s special of Saute de veal a l’orange featured veal served in an orange sauce along with rice. I was a huge fan of the sear on veal paired with its overall tenderness. It was a juicy and rich dish cut by the orange’s acidity. Comforting with a dash of brighter flavors, again, it’s another dish you want to tuck into when it’s windy and damp. We both agreed that we’d rather have mashed potatoes than rice (though it might not, in all honesty, pair as nicely), but the rice was perfectly cooked and not mushy or over-salted at all. Over all, Gaspard de la Nuit met and exceeded our expectations–definitely would recommend to friends in the same way that it was recommended to us. 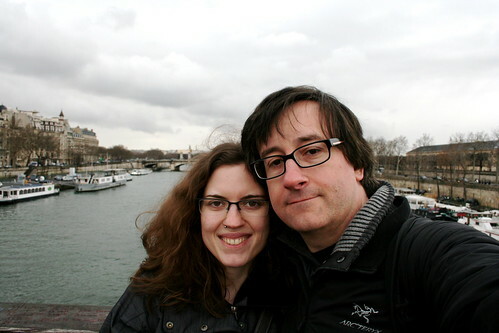 The only time we were in Paris was for new year’s, which was awesome…except that practically everything was closed. Sad trombone! 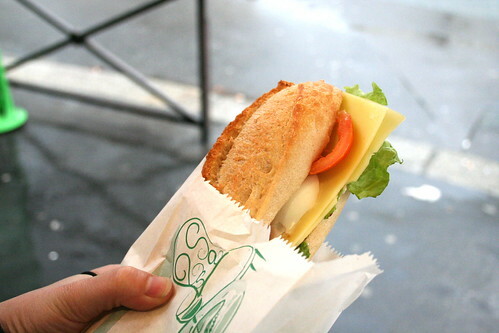 But we still got to walk around and around and around and eat baguettes and sandwiches from street stands. just thought I’d add my reply from FB….. Thank You for visiting Gaspard de la Nuit!! And for sharing all these fantastic sites and stories. A wonderful read to start my day during my usual hard boiled eggs and toast breakfast, while contemplating my return to India, sadly, without the stop in Paris, this time. Maybe one day we can eat there together! I really wish those weren’t little globules of pork in the first picture because it looks really, really good. Do you know if they use eggs in the noodles? Ok, wow, that place in Italy looks amazing/super creepy. Adding it to my one-day list for sure (I know G would love it). As for Happy Nouilles, I’m pretty sure they use egg in their hand pulled noodles, but they also have sweet potato noodles (yay, love those!) and their vegetable dishes looked so so so good–especially the baby bok choy. Not sure if they use non-veg broth in their veg dishes (they also have vegetable stir-fry noodles), but they spoke English so communication wasn’t a problem. If you’re in the area, I’d definitely check them out. Also, definitely go to the falafel place in the previous post and, in Marais, there’s a great little restaurant that used to be all veg and is now half-and-half called Le Passage Oblige (http://www.lepassageoblige.com/) I wasn’t able to get a chance to eat there, but the menu looked incredible & I heard nothing but fantastic reviews!